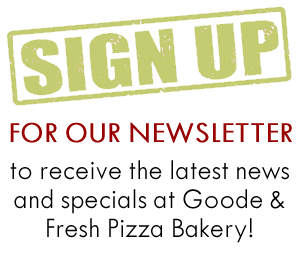 We don't call ourselves "Goode&Fresh" for nothing. WE USE the freshest ingredients available year-round. WE NEVER compromise quality for speed or price. somersaults to offer you the best in quality, value and service. OUR GROWING following of customers dating back to 1983 when we first opened our doors is a testament to our quality, value and service and love of Goode food.